JOIN US ON DECEMBER 14, 2018 FOR A RETURN OF THE BBYC KITCHEN PARTY. Robert Tees and his musical friends are at it again. 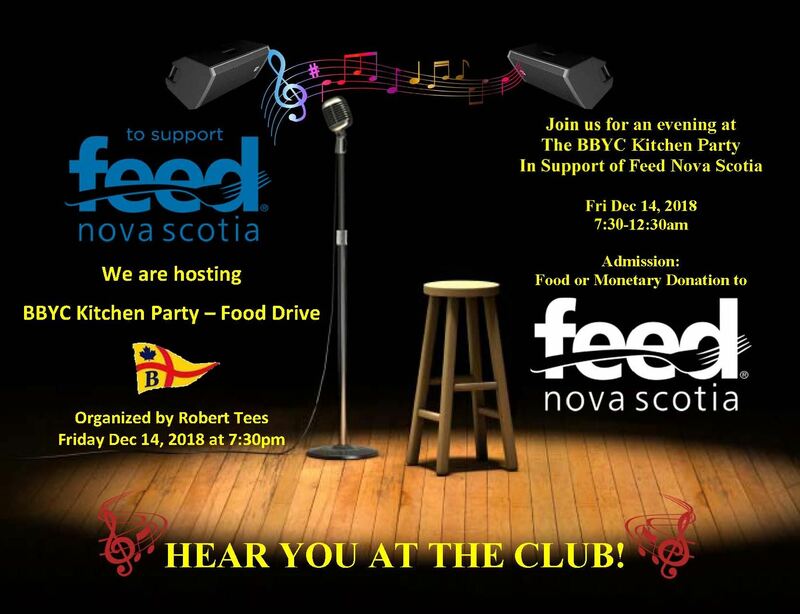 Please join us a the BBYC Wardroom on Friday December 14, 2018 for the BBYC Holiday Kitchen Party in support of Feed Nova Scotia. The Wardroom will open its usual time on Friday with music starting around 7:30PM. Wear your best Christmas Sweater for a chance to win a prize. This event is in support of FEED NOVA SCOTIA. Admission is a food or monetary donation which will be delivered to FEED NOVA SCOTIA. If you don't have time to stay and listen to some great music, please stop by and drop off your donation. Cheques made out to FEED NOVA SCOTIA will generate a A Charitable Donation Receipt provided a name and address is included. As of December 5, FEED NOVA SCOTIA indicated they were 7000 meals short of their goal for the season. Did you know that $2 can generate 3 meals. Tis the season to give.